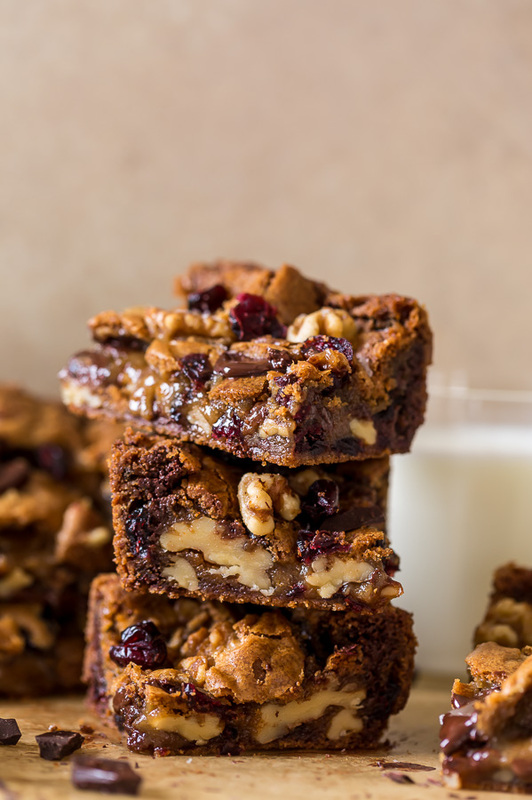 Chocolate Cranberry Walnut Blondies are crunchy, chewy, gooey and so delicious! A super easy blondie recipe that’s made in one bowl and so perfect for the holiday celebrations. I love cookies so it’s no big surprise I really love blondies, too. Blondies are basically just gooey cookie bars, after all! But they’re even easier than baking cookies. 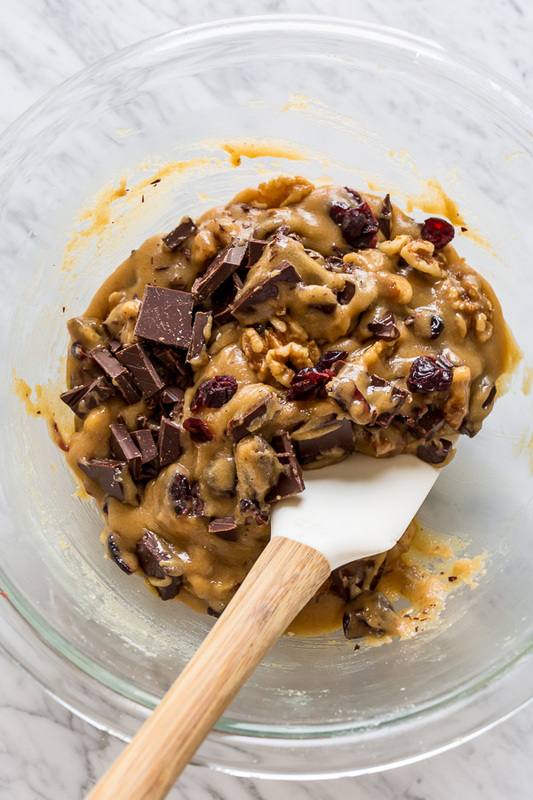 Because all you have to do is combine the ingredients, scrape the batter into a pan, and bake! And in the world of baking, it really doesn’t get much easier than that. 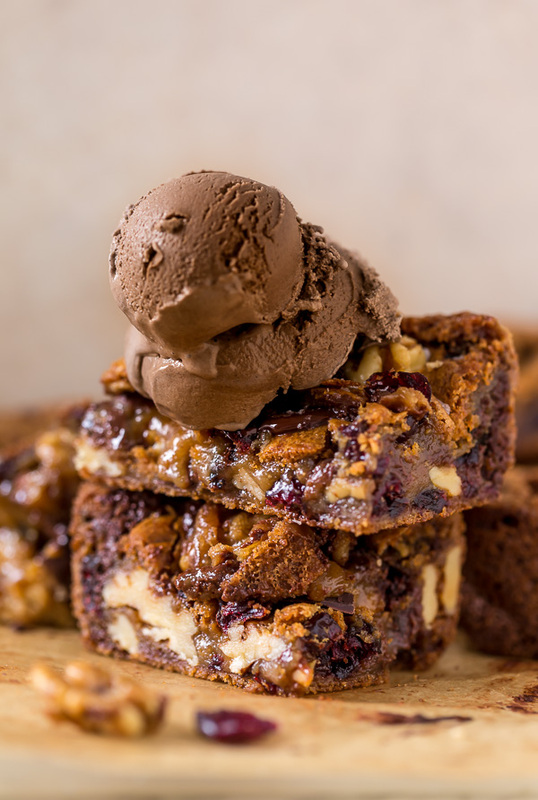 You only need a handful of basic ingredients to bake these thick and chewy chocolate cranberry walnut blondies! Specifically, you’ll need: butter, brown sugar, an egg, vanilla, flour, cinnamon, baking soda, sea salt, walnut, cranberries, and chocolate. That’s it! 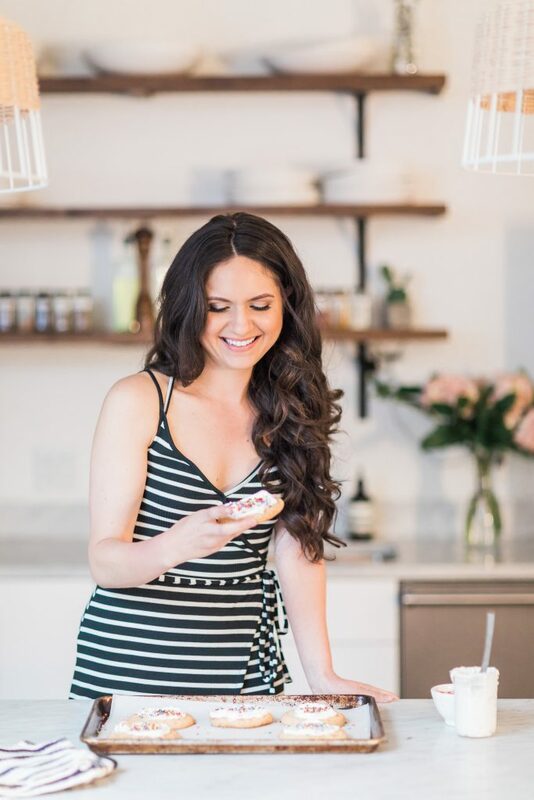 And I bet you have most of those ingredients in your kitchen right now… am I right?! I hope I am so you can bake these today. 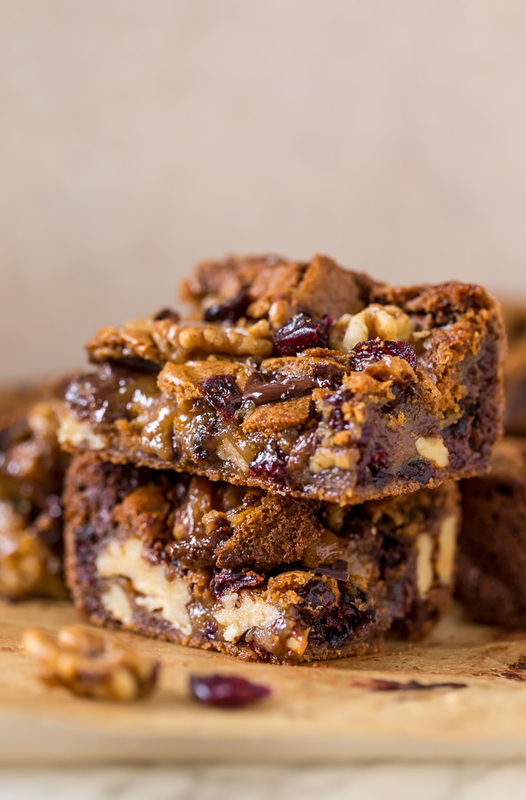 As far as the chocolate goes, you may use any variety you’d like; I think milk chocolate, dark chocolate, semi-sweet chocolate, and even white chocolate would be delicious in this blondie recipe. And you can definitely use chocolate chips if you don’t have bars of chocolate on hand. 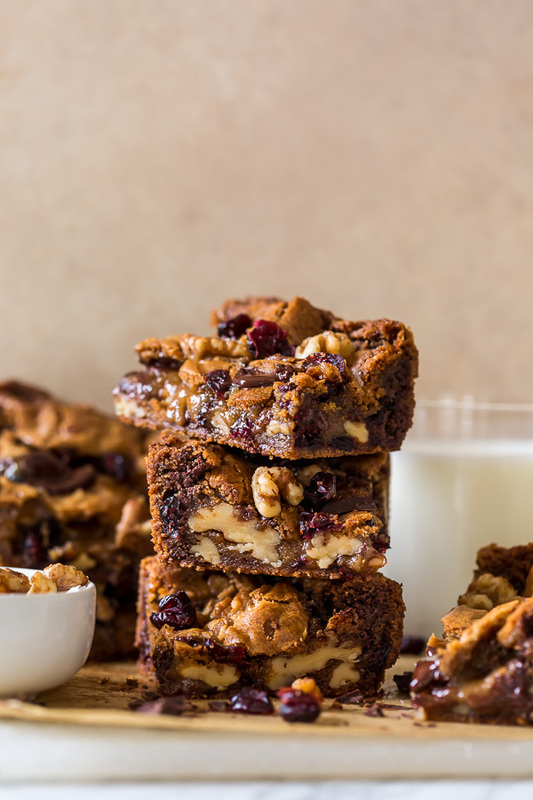 You’ll need dried cranberries for this recipe. Fresh cranberries will not work in this recipe. But if you can’t find dried cranberries, feel free to use dried cherries in their place. Not a walnut fan? Try subbing hazelnuts or pecans! Or omit them all together if you’re allergic. Feel like kicking the flavor profile up a notch? Brown the butter before adding it to the batter! I usually do this because I’m a brown butter fanatic, but it’s totally optional. Assembling this blondie recipe is seriously so simple! And since this is a one bowl baking project, it’s not very messy either. You’ll simply combine the melted butter, brown sugar, and vanilla. Then whisk in the egg. Then basically whisk in everything else! 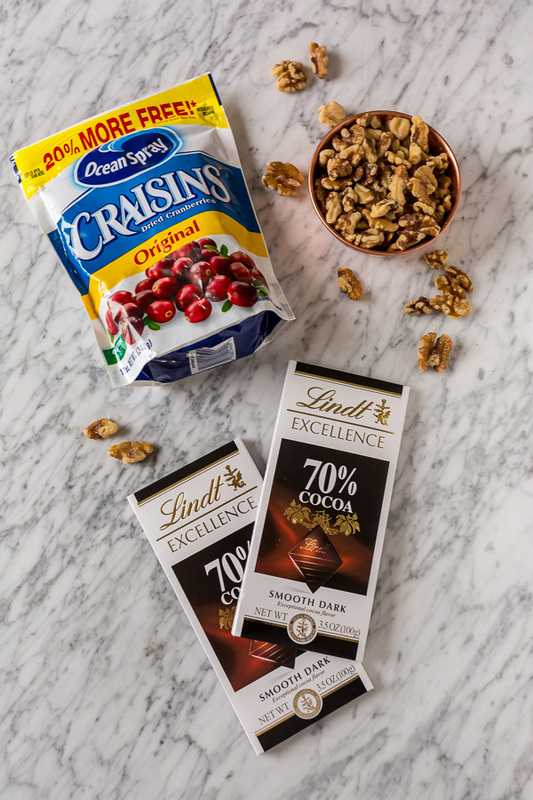 Actually, I suggest you fold in your walnuts, cranberries, and chocolate. But that’s easy, too! Just use a rubber spatula or whatever kind you have in your kitchen. Even a wooden spoon could work. I chose to bake my blondies in a loaf pan pan because this method yields SUPER thick and crispy edges and extremely soft (read: gooey!) centers, but you can also use an 8-inch square baking pan for a more uniformly even blondie. So you have options! Don’t over bake your blondies! When you pull them from the oven they may look a little wiggly wobbly in the center… but don’t fret because this a very good thing. 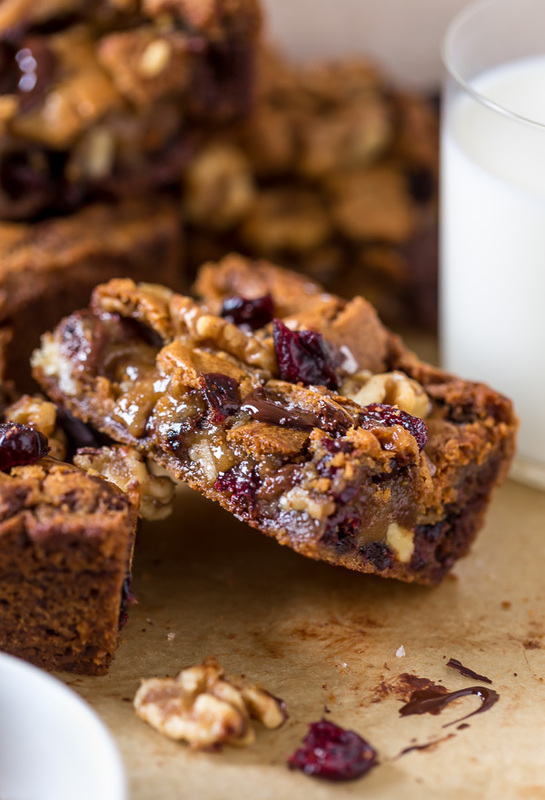 The chocolate cranberry walnut blondies will firm up a great deal during the cooling process. Plus, I’m pretty sure no one has ever complained of a gooey blondie before. If you’d like your blondies to be extra pretty, press a few chunks of chocolate on top as soon as they come out of the oven. Then press a few walnuts and cranberries on top. 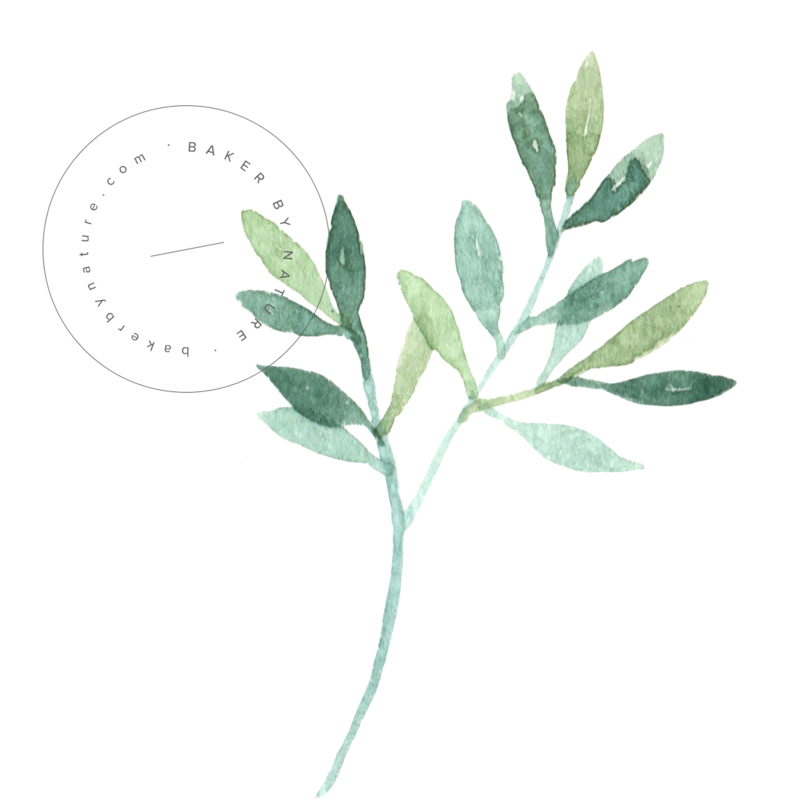 And finally, sprinkle on a little sea salt. All of this is over the top and optional! But I do it… so I wanted to share in case you want to, too. Ok, so here’s the deal with cooling these blondies: the longer you cool them, the better they’ll slice. So if you want very clean and firm cookie bars, I suggest letting them cool completely in the pan before slicing. But if you’re like me and don’t really care about how they look, feel free to cut after just 15 minutes of cooling in the pan. 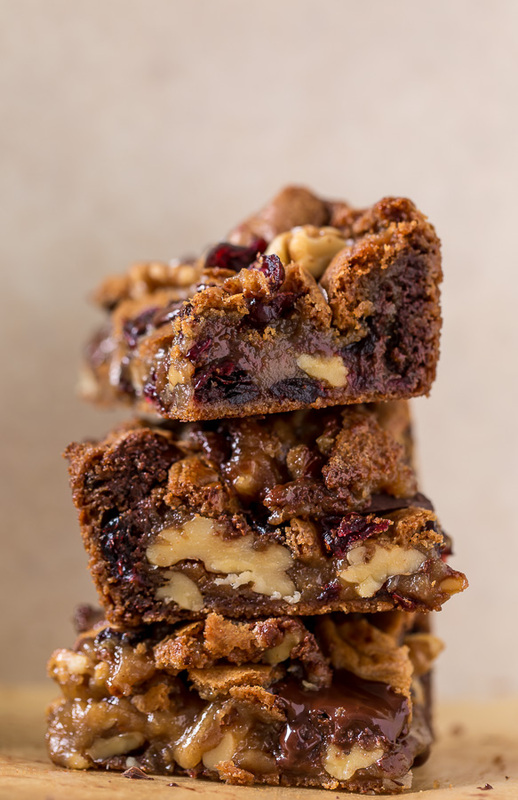 They’ll be a little messy… but still so gooey and delicious. The choice is yours! 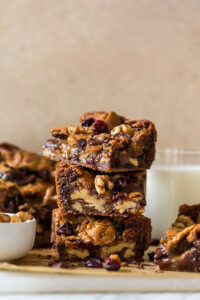 Chocolate Cranberry Walnut Blondies are crunchy, chewy, gooey and so delicious! A super easy blondie recipe that's made in one bowl and so perfect for the holiday celebrations. Preheat oven to 350 degrees (F). 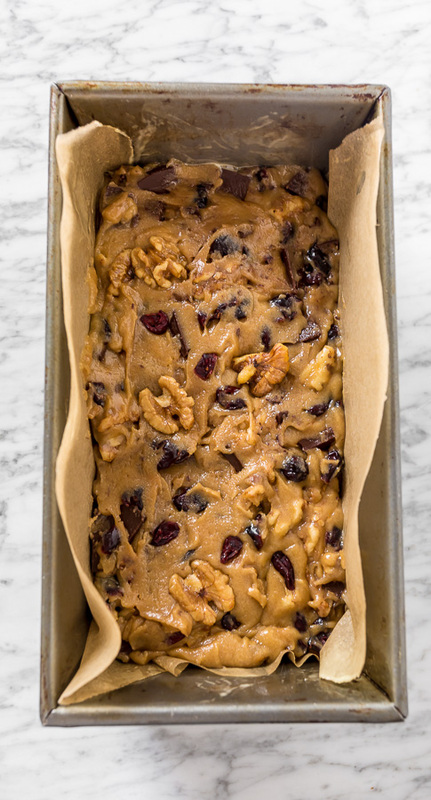 Line an 8x8 baking pan with parchment paper; spray lightly with non-stick spray and set aside. In a medium-size mixing bowl, combine the melted butter and brown sugar and whisk until well combined. Add in the egg and vanilla, and whisk until combined. Add in the flour, baking powder, and cinnamon, and whisk until JUST combined, being sure not to over mix. 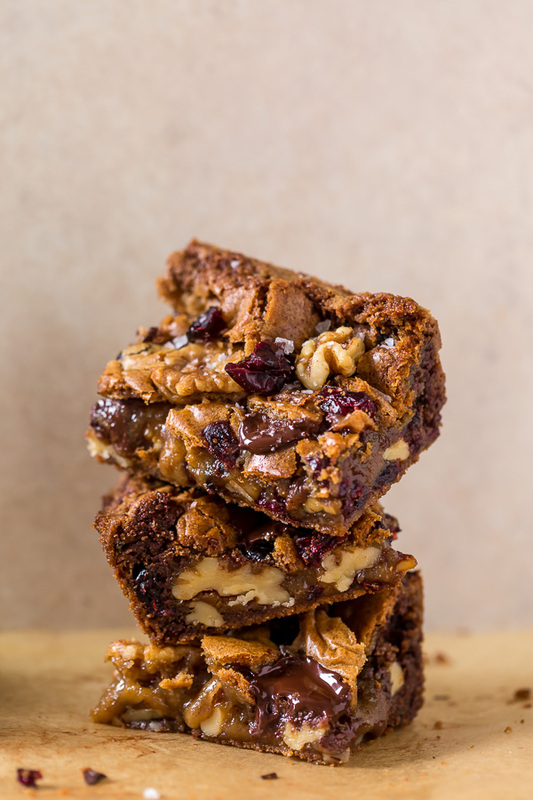 Using a rubber spatula, fold in chocolate, walnuts, cranberries, and sea salt until combined. Bake for 25-28 minutes, or until the edges are firm and golden and the center is just slightly wobbly. Cool in pan for at least 15 minutes before cutting. I’m thinking of trying this recipe for the holidays. Are these bars freezable??? Yes! Just thaw and briefly reheat before serving. Would the recipe work for cookies? But I also used a loaf pan, does that make the cooking time longer?